...that Jacob loved Rachel more than Leah. He also saw how it hurt Leah to be loved less (it always hurts to be loved less, so always love the best you can!). Well, maybe Jacob loved Leah less, but God didnt. And so God blessed Leah, and soon she was going to have a baby. 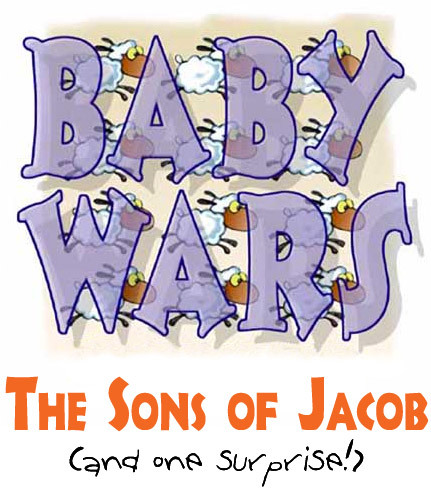 The necessary months passed, and soon Jacob was the father of a newborn baby. It was his first child. It was a boy, and Leah named him Reuben, a name that sounded like God has seen my trouble in her language. Now Jacob will love me more, Leah thought. But still, Jacob didnt love her any more. And so she had another baby. She named her third child Levi. That means Tied together. Jacob will surely be tied to me, now that I have given him three sons, she thought. All this time, Rachel wasnt able to give Jacob any children. She had to watch her sister cuddle and play with each new baby. And she had to stand by and watch while Jacob spent more and more time with Leah and his children. Every time her sister had a baby, it bothered her more and more. She was afraid Jacob would stop loving her. Lets have a baby together, before I waste away and die, she finally said to Jacob late one warm summer evening. But Rachel was desperate, so she said, Then marry my servant, and have a baby for me by her. And so Jacob married Rachels servant, and soon they had a son. Rachels servant had another baby. They were trying to see who could have the most babies, to see who Jacob would love best. Now Leah was the one, watching Rachel bouncing a new baby on her knee. And Jacob was spending more time with Rachel again. Leah saw how happy Jacob was. Soon, Leahs servant had another baby. Leah said, How happy I am! Now other women will call me happy too! And so she named her new son Asher, which means "Happy." Now Jacob was the proud father of 8 growing boys! Reuben, Simeon, Levi, Judah, Dan, Naphtali, Gad, and Asher. And then, surprise of surprises, Leah had ANOTHER baby - only this time - it was a girl! She named her Dinah. Jacob was now the father of twelve; Reuben, Simeon, Levi, Judah, Dan, Naphtali, Gad, Asher, Issachar, Zebulun, Dinah, and Joseph. This last one, Joseph, was going to change their lives forever.